When my youngest brother, Red, was in kindergarten, I was in seventh grade and would get home from school before he did. On Fridays, I liked to surprise him with fresh-baked treats. I would be sure to get the Betty Crocker wild blueberry muffin mix with the blueberries that came packed in a can. I swore that’s what made the muffins so good. These days, though, I do most of my baking from scratch. 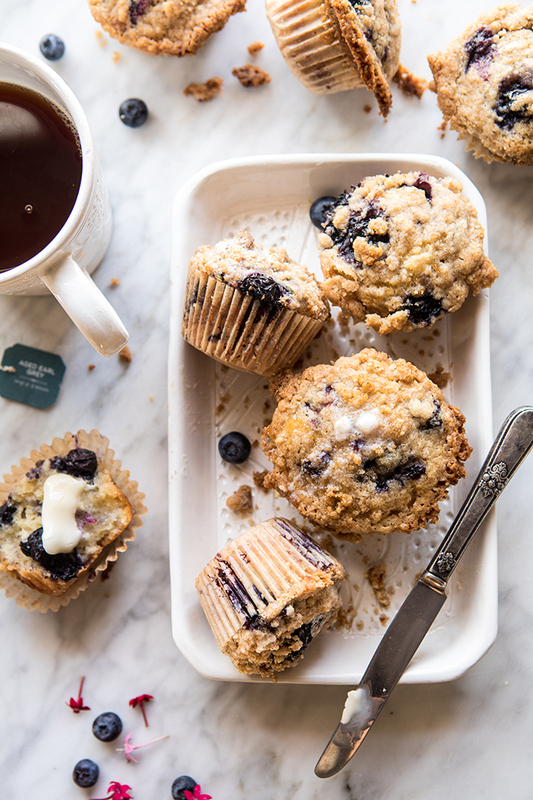 This version has the slightest hint of Earl Grey tea and is loaded with fresh blueberries that burst while baking, making the berries even sweeter and more delicious. Finish with a generous amount of cinnamon streusel and you’ll have the tastiest muffin—maybe even better than Red’s after-school snack. 1. Preheat the oven to 375°F. Line 15 to 18 wells of two muffin tins with paper liners. 2. In a small saucepan, bring the milk to a gentle simmer over medium-low heat, then immediately remove the pan from the heat—do not allow the milk to boil. Add the Earl Grey tea bags and steep for about 15 minutes, then discard the tea bags. 3. In a large bowl, combine the canola oil, honey, ¼ cup of the brown sugar, the yogurt, vanilla, egg, and egg yolks and stir until evenly mixed and pale in color. Add the steeped milk and stir to combine. Add 3 cups of the ﬂour, the baking powder, and the salt and stir until just combined. 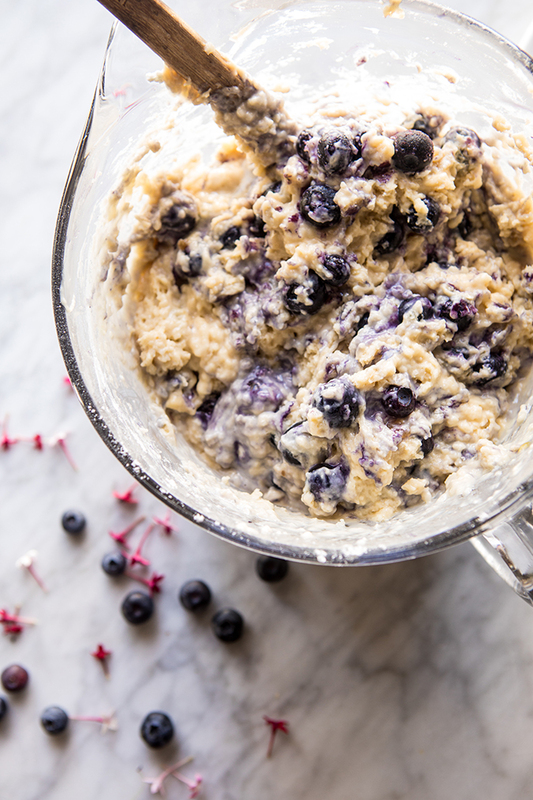 Gently fold the blueberries into the batter, taking care not to over mix (otherwise the batter will turn blue). Divide the batter evenly among the muffins cups, ﬁlling them three-quarters of the way full. 5. Bake for 15 to 20 minutes, or until a toothpick inserted into the center comes out clean. Eat them while they’re hot! 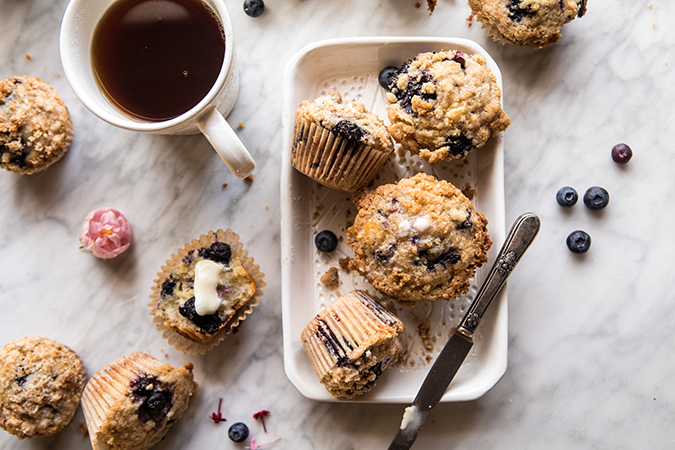 There’s no better way to start your morning than with a steaming batch of these Earl Grey blueberry muffins and a mug of tea. Plus, how adorable do they look atop handmade Moroccan ceramics from The Little Market? Whenever you purchase ceramics like these serving trays and mugs, you are directly helping the female artisans that created them. We can’t think of a dreamier, or more rewarding, breakfast set up! For more homemade and incredibly delicious recipes, be sure to check out Tieghan’s website here, and you may want to pick up a copy of her cookbook, Half Baked Harvest Cookbook: Recipes from My Barn in the Mountains. 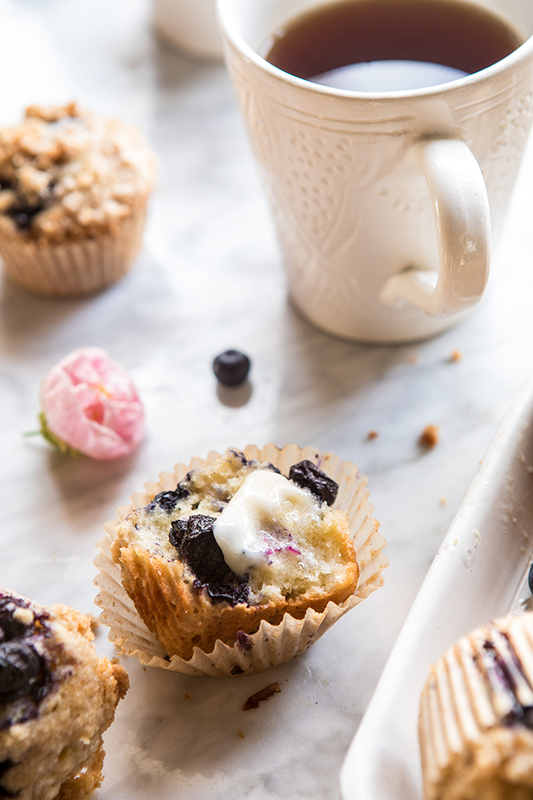 Will you be giving this muffin recipe a try?